THUG is one of those films which has the power to really surprise you. 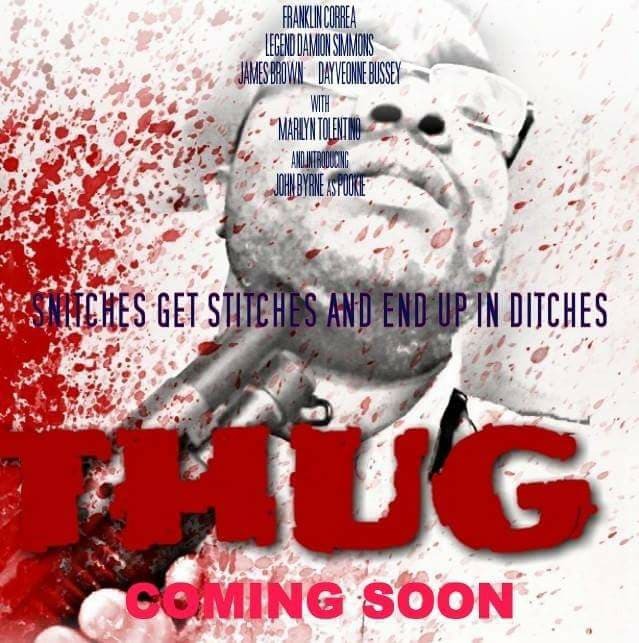 Shot for a pittance (probably), and utilising the small cadre of actors as its film crew, Thug starts off as a typical student documentary film which at some point is hijacked and sent into a totally different direction. Franklin Correa is able to make everything sound authentic by giving the audience a proxy - Randal isn't from Brick City, he's a college student who probably comes from a middle class or rich family, whose only encounter with drug dealing and thug life is from watching Breaking Bad and The Wire. He's as clueless as the rest of us, so it forces Jino to explain some of the lingo (white girls - cocaine; raspberry ripple - actually no, let's not dwell on that). As an interview subject, Jino is very cagey about what personal information he wants to share - "No Government" is an expression he keeps using when Randal digs too deep for comfort. The way Jino slips into casual violence makes him seem like a street version of Joe Pesci from Goodfellas/Casino. There are hints of a tragic past, a road not travelled, but overall Jino is an unsympathetic but compelling character to watch. It's also interesting that Jino, the "street" guy, is Hispanic and could basically pass for white, while Randal, from a more middle class background, is black, giving the film on a surface level a sense of role reversal. Whilst watching Thug, I was very much reminded of the cult classic Man Bites Dog, which turns out to have had a significant influence on the film. It has a similar cinema verite style, with characters talking directly to camera (and therefore, to us the audience). Like Man Bites Dog, there comes a point where we the audience, through our silent voyeurism, become complicit in Jino's actions. And it's not like we didn't see it coming, either, as Jino has a particular MO that's easy to recognise. We see the signs but remain silent. Considering some of the things that happens in the film, THUG is a bit anaemic. It needs more blood splattered around to sell a couple of the scenes. Other than that, the film works really well - the guerrilla style film-making and authentic sounding dialogue draw you into a world most of us wouldn't see. What makes the film compelling though is the way the plot develops and heads off the reservation into a bit of a head trip.